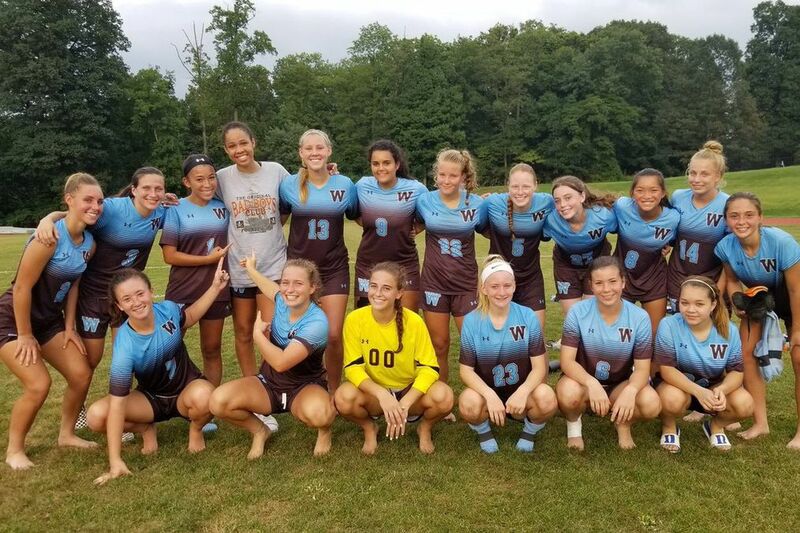 Westtown girls’ soccer team after a 1-0 win against Downingtown West on September 7th. Dakota Taylor netted two goals Wednesday as the Archbishop Wood boys' soccer team topped Archbishop Ryan, 4-0, to remain undefeated in the Catholic League with a 5-0 record. Joe Trodden and Christian Petro contributed goals for the Vikings. Eric Williams recorded his first career hat trick as Roman Catholic defeated Cardinal O'Hara, 3-0. Williams' second and third goals came within 47 seconds of each other in the second half. Jimmy Tobin provided two assists to while Jared Dillon had one. Kevin Tobin and John Nelson combined for the shutout in net for the Cahillites. Corey Brunner scored the game's lone goal in the second half to lift Malvern Prep over the Hill School, 1-0. Will Reckmeyer and Austin Coron combined for the shutout for the Friars. New Foundations upended MaST Charter, 2-0, thanks to goals from Ernesto Altomare and Eddie Kuhlmeier. Alyssa Krady scored a goal seconds before halftime to lead Souderton to a 3-1 triumph over Methacton. Randi Hess and Jenna Hunsicker added goals for as Jordan Michalak made eight saves for the Indians. Damaris Gimenez registered three goals as Constitution took down String Theory, 7-0. Ricshawn Walker contributed two goals for the Generals. Abby Galaska, Brenna McCarry, Maggie McCay, and Natalie O'Neill all delivered goals as Little Flower beat Franklin Towne Charter, 4-0. Anna Salvucci paced Episcopal Academy with two goals as the Churchwomen rolled to a 5-1 victory over the Hill School. Westtown came back to beat Notre Dame, 3-1, thanks to three second-half goals. Halle Brown, Amaya Douglas, and Sara Oswald provided the goals for the Moose. Brooke Bozarth, Sara Kennel, Emma Kratz, and Peyton Scialanca each scored in Dock Mennonite's 4-1 victory over Delco Christian.